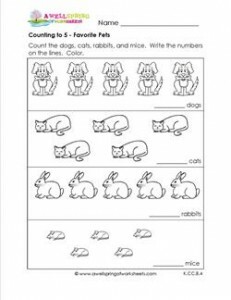 Kindergarten Counting Worksheets - Count to 5 with Pets! Now you’re getting somewhere. Almost halfway to counting to 10. This counting to 5 worksheet will remind you of your favorite pet! Is it a dog, a cat, a rabbit or a mouse?